IMyBags: COACH, BURBERRY, PRADA, GUCCI, MIU MIU and FENDI at up to 70% discount! 100% Authentic COACH, BURBERRY, PRADA, GUCCI, MIU MIU and FENDI megasale! 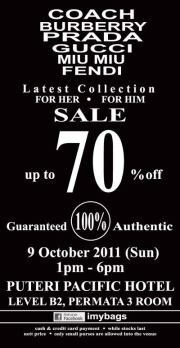 IMyBags is having a promotion at Johor Bahru! For more details, please visit IMyBags Facebook page.